The ratio of the sum of two quantities over the larger quantity is equal to the ratio of the larger quantity over the smaller one. From the golden ratio, we get a mathematical constant - a number. It is the number 1.6 which, by convention, is represented by the Greek letter φ (pronounced "fee"). The number φ is a mathematical curiosity. Like the mathematical constant π, φ appears everywhere. The good, of course, is always beautiful, and the beautiful never lacks proportion. The golden ratio is found in the proportions of leaves. 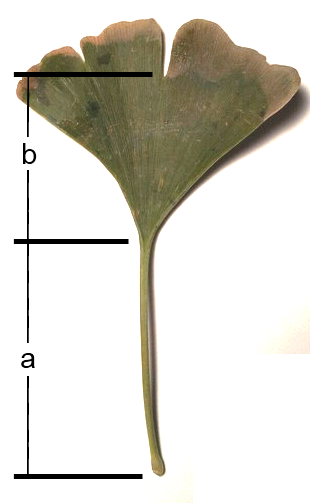 I measured the golden ratio in the leaf of a ginkgo tree. Using the typographical units of pica, I measured 28 pica from the notch to the base of the stem of a ginkgo leaf. I then measured 17 pica from the top of the stem to the base of the stem (length a). The quotient of 28 pica over 17 pica yields the golden ratio 1.6. Scientists have recently observed nanoscopic symmetry. The symmetry they observed had the attributes of the golden ratio, demonstrating this curious proportion at the quantum level. Golden ratio discovered in a quantum world, Jan 2010, Science.